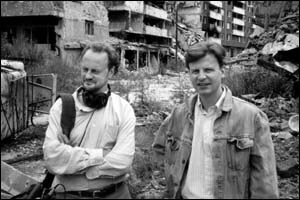 IN JULY, 1996 Minnesota Public Radio Senior Producer/Reporter Stephen Smith and correspondent Michael Montgomery traveled to Sarajevo to investigate the death of Montgomery's Serbian friend Predrag Bundalo. The documentary, "Face of Mercy, Face of Hate," was the result. A broadcast version of the documentary aired September 13, 1996 on All Things Considered and locally on MPR news and information stations. MICHAEL MONTGOMERY pushed past the plywood nailed across the doorway. Inside the apartment, heaps of clothing, broken bottles, and family photographs clogged the hallway. When forced to give back control of this Sarajevo apartment building last spring, the Bosnian Serbs trashed whatever they couldn't cart away. According to our notes, this was where one of Michael's closest friends was shot to death in May, 1993. At the time, Bosnian Serbs controlled the Sarajevo neighborhood. Predrag (known to his friends as "Gaga") was one of those Serb fighters. Gaga's body was found slumped on a couch in the apartment of a neighbor, an aging Muslim woman. The gun was missing. Bosnian Serb army commanders dismissed Gaga's death as a wartime suicide. One of Gaga's Serbian friends told Michael that Gaga was murdered for protecting Muslims in his apartment building. We clawed through piles of debris in the wrecked 9th floor apartment. Michael uncovered a photograph of himself. "This is Gaga's stuff," he said with both excitement and horror. Michael Montgomery covered the collapse of Yugoslavia for the London Daily Telegraph. A graduate of St. Paul's Macalester College, Michael witnessed first-hand the siege of Sarajevo and brutal acts of ethnic annihilation in the countryside. Gaga was a close friend from before the war, an amateur photographer and mountain-climber. When the Bosnian Serbs attacked Sarajevo, Gaga vanished from Michael's view behind Serb battle lines. It was a war where friends ­ even relatives ­ became overnight enemies. "As I crossed the streets in Sarajevo, I often wondered if Gaga was the sniper shooting down at me from the hills," Michael told me. Michael and I returned to Sarajevo this summer to investigate the mystery of Gaga's death. In loyalty to his old friend, Michael hoped we would find that Gaga had, indeed, been killed for acts of compassion rather than acts of war. As we probed the evidence, a disturbing picture emerged of a man warped by the absolute power of wartime violence. Gaga's portrait is the face of kindness and evil in one. It was a face Gaga could press against the eyepiece of a camera to make sensitive photographs of mountain wildflowers. It was also a face that could squint through the scope of a sniper's rifle and terrorize the city, Sarajevo, that Predrag Bundalo and Michael Montgomery once shared.